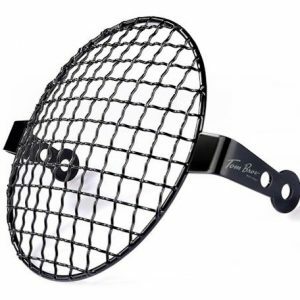 This chrome plated headlight stone guard (grill) adds an attractive look as well as protecting the glass light from rocks and other on and off road debris. Fits AIR COOLED Bonneville, Thruxton and all other bikes with 7” headlights. Kit includes the stone guard, 2 custom made side clips and a custom bolt clip for easy installation and easy removal for cleaning. Detailed instructions with illustrations are also included.